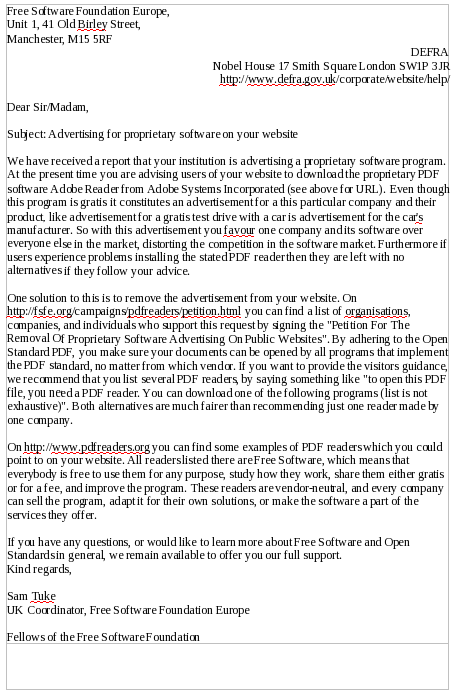 The letters to the UK government departments and institutions requesting the removal of adverts for proprietary PDF readers have finally been prepared for sending! 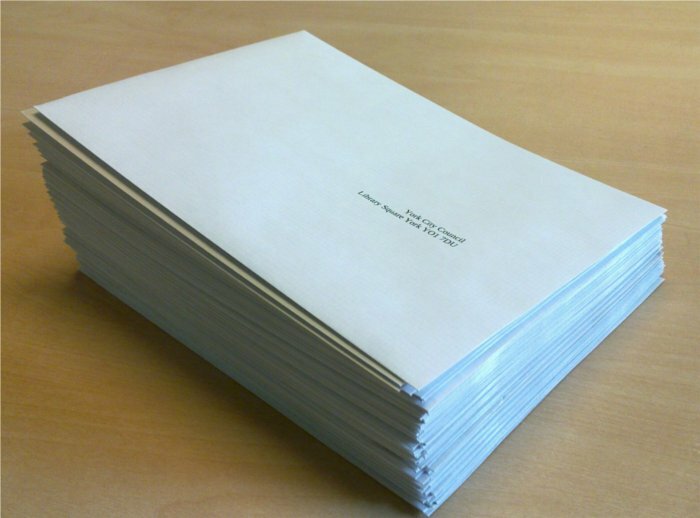 I wrote a new PHP script to generate the ODT documents complete with envelopes, and then printed and folded them all. There were 65 in total, which represent all the new adverts that were reported leading up to and during the recent UK PDF Readers Sprint. The text of one of the generated letters, in this case to the Department for Environment, Food and Rural Affairs, is shown below. Hopefully these letters will help to shake up the attitudes of some UK councils and get them thinking about using more Free Software and Open Standards within their organisation. I’ll get these letters posted as soon as I can. OggCamp 2011 attracted 200-300 people, and the FSFE booth was successfully run by myself and Chris Woolfrey. We talked to approximately 60 people, handed out approximately 120 leaflets, received one donation, and sold five t-shirts. 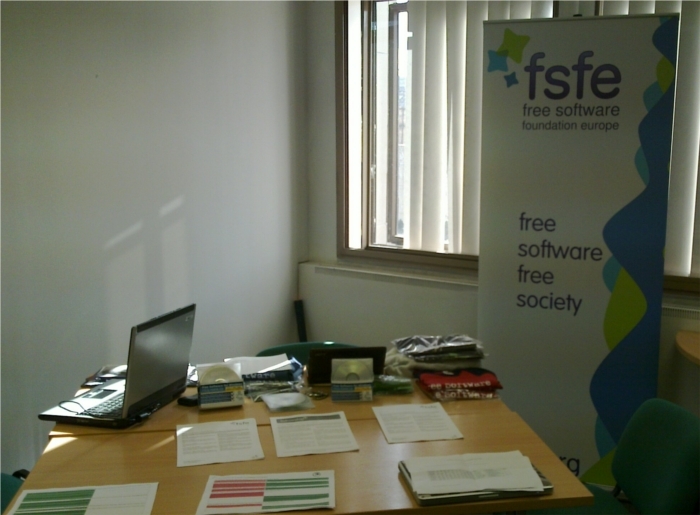 FSFE was generally well received and I felt that the booth was a great success. OggCamp 2011 was a two day conference with talks and a small number of booths held in Surrey, about 1hr from South Central London. It is organised by Linux Outlaws and Ubuntu UK podcast. Some attendees had come from as far as Sweden and the USA in order to attend. 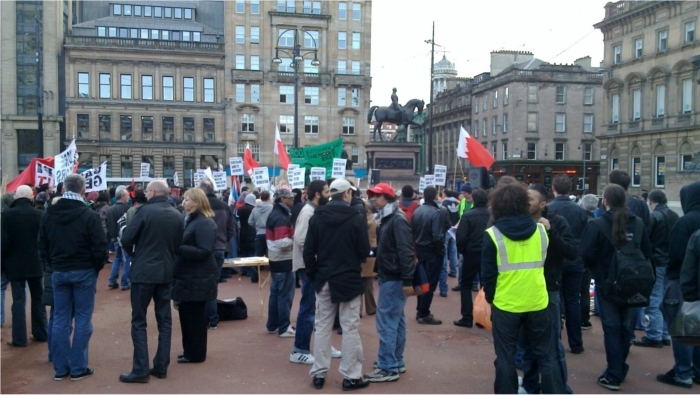 The subject of the talks varied from the political to the technical, with an apparent emphasis on community activism. Ubuntu users and advocates made up a large part of attendees. Due to the PDF Readers Sprint in Manchester on Saturday 13th, we arrived before lunch on Sunday 14th at OggCamp after traveling from London, and set up the booth in time for the lunch time crowds. Once set up, the booth looked professional and attractive, and generated interest throughout our time there. Ten minutes after arriving I was interviewed by Hacker Public Radio for their podcast, which will be published this week. 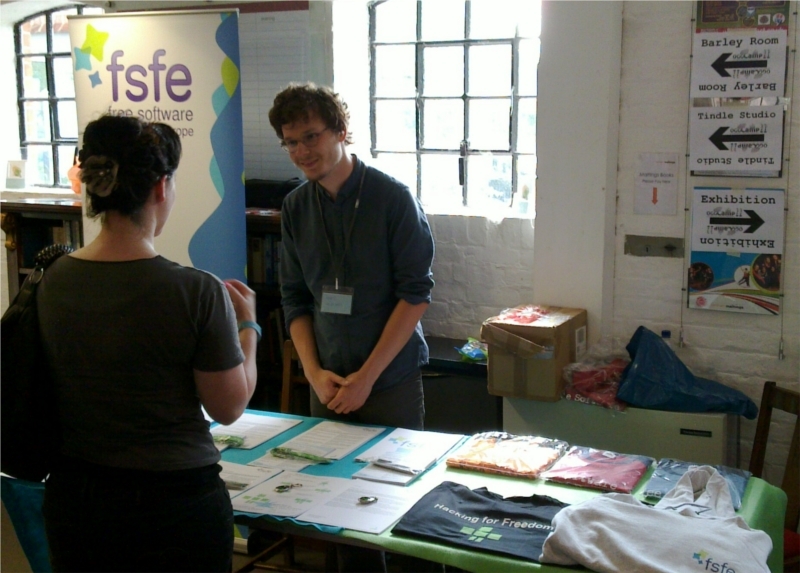 I answered spontaneous questions about FSFE’s purpose and activities in Europe and the UK. Whilst no new Fellows signed up at the event, more than ten people said that they intended to sign up at fsfe.org. 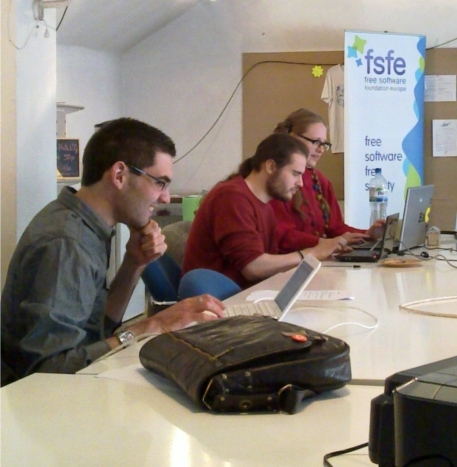 Most people that we spoke to had little or no knowledge of FSFE, and whilst many were supportive, introducing someone to FSFE and also successfully encouraging them to join within the space of a few minutes proved difficult. I took the opportunity to advertise the 5 EUR per month payment option, and I was very glad to be able to offer this. I was told that during a talk which took place before we arrived, when the speaker was asked how people could support the spread of Free Software in the UK, he replied that one way was to join FSFE. Two FSFE Fellows had come to OggCamp independently of us as ‘crew’ helping to organise the conference, and were wearing FSFE t-shirts, which was very encouraging to see. So far my battle to file my tax return online has taken six weeks. The official method of submission has failed repeatedly, and my attempts at resolution have led me into a web of usability nightmares. After having found the tech support telephone number using a search engine (ten minutes of searching the tax website hmrc.gov.uk proved futile) I embarked upon my epic voyage. Several of these can only be retrieved by post; a request must be made, in some cases exclusively by phone, to have the data sent to your registered postal address. The UTR allegedly takes 72 hours, and the activation code allegedly takes 7 days (in my case it took 10). Once your activation code arrives, it has be used with 28 days, after which it expires and you have to order and wait for a new one. 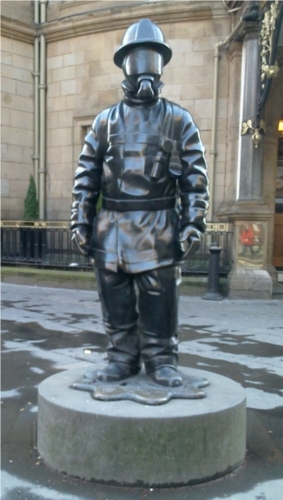 However, if the address that they have on file is out of date (which is likely as many people only contact the tax office once each year to file their return) then you must wait a further 72 hours after changing your address (which must be done by phone) before you can proceed with any part of the registration process. As far as I can tell the user ID cannot be retrieved at all, and it isn’t sent to you at all so unless you copy it when it shows on screen the first and last time during the prolonged registration process, then you have to start again. The gateway ID (confusingly also interchangeably referred to as the user ID) cannot be retrieved either, at least not in its entirety. Half of it is presented on the HMRC after you’ve provided identifying information, and the other half is emailed to you. You could be forgiven for thinking that once you’ve completed the strenuous registration process once, you can use the HMRC website again for other tax filing services that they offer. This is not the case however; there are multiple different types of accounts, so each person can end up with several accounts on the HMRC website and therefore several complete sets of most of the bits of data listed above. This doesn’t become apparent until you try and use a new service, and are presented with an uninformative “Access denied” message, which simply points you back to your account homepage with no explanation, help or guidance. If you registered last year in order to pay the tax man for the privilege of notifying him that your company name and details still haven’t changed, and this year you want to file your self assessment tax return, then you need to register a new account, and wait for the necessary data to be posted to you all over again. However, even if you go through this process, there is still no guarantee that you’ll be able to fulfill your legal obligation to file your tax, as I recently discovered. You have tried to access a page that you have no permission to view. Next leads to your account homepage, without any mention of how to fix the error or what caused it, or who to call. After a call to the well hidden tech support number, I double checked that I hadn’t visited the HMRC website via a link from a search engine, which I was told is enough to break the login process (a major bug in itself, surely? ), and then was told to register another account. This I did, then waited ten days until my activation code arrived, at which point I tried to log in with the new account, and once again met with “Access denied”. By this time the deadline for filing tax returns had passed, and I was liable for an arbitrary £100 fine, despite the fact that I started the process of trying to file my tax with my existing HMRC online account with more than a week to spare. I called up again, and was told again to register a new account. This I have done, and am still waiting for yet another activation code to arrive in the post. Because I can’t change my registered address without more delay, the code is going to somewhere that I no longer live, but fortunately I set up postal forwarding so hopefully it will be delivered correctly to my current residence. HMRC’s online tax filing system is painful to use and has cost me more than £100 in late fines and phone calls to their call center (the message recommends calling back in a few weeks due to high volume of enquiries: each person that follows that advice is worth £100 in fines!). Its also wasted hours of my time, and caused me considerable stress and frustration. All because of a badly designed usability-ignorant filing system. This is a system that’s used by tens of millions of people each year – surely HMRC should provide a better service than this! On Wednesday night I travelled from Manchester to London to attend the ODF Plugfest event, located in nearby Maidenhead the following day. Just before catching the train from Manchester Picadilly, I collected a new 2m tall self-supporting FSFE banner, for use at the booth that I would be running a few days later at the Pirate Party Conference. I stayed with British FSFE team member Chris Woolfrey in his London flat, and on Thursday morning I took the train to Maidenhead, and headed to the town hall, where the ODF Plugfest was being hosted. During the day there were several talks on various technical aspects of Open Document Format, including new solutions in KOffice to old interoperability problems between desktop ODF editors. Basil Cousins, co-founder and Director of Open Forum Europe was present, as were Paul Adams, COO of Kolab Systems and former FSFE British Coordinator, Michael Leenaars from nlnet, and representatives from Microsoft, among others. In the evening I had several discussions about new potential Document Freedom Day activities for 30th March. These and other opportunities give me hope that this DFD will be the best ever for the UK. That evening I returned to Chris’ house quite late, and spent some time discussing internet marketing opportunities for FSFE with an old friend of mine. 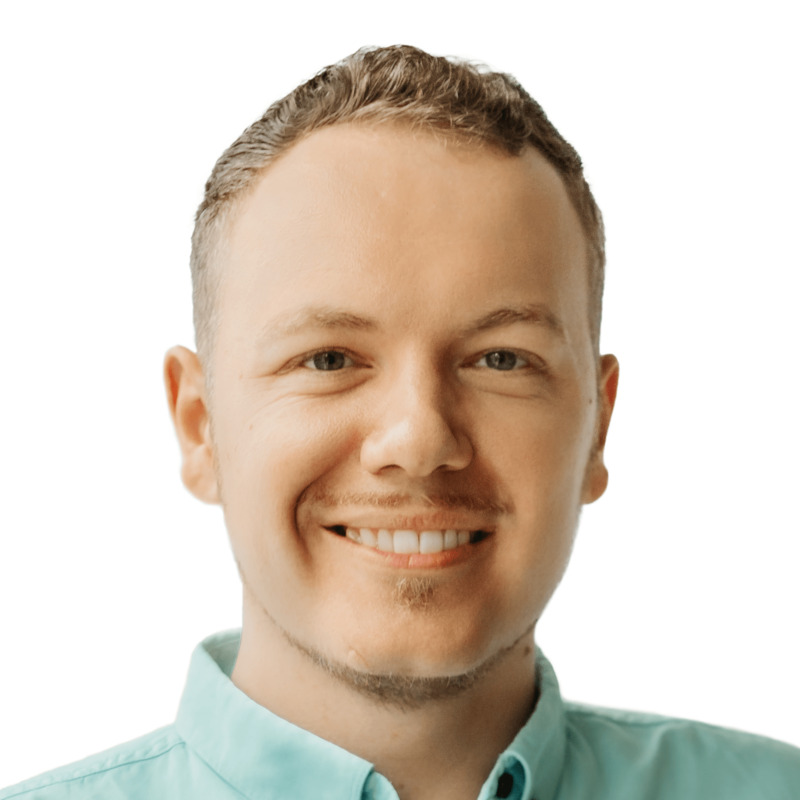 We had a look at FSFE’s (currently disabled) Google Adwords account (donated by Google), and arranged for him to use his extensive experience to help manage future internet marketing campaigns. The following morning I went to a printing shop in Whitechapel, and printed around 50 pages of information and leaflets for the Pirate Party Conference. I then took the train North to Glasgow, arriving just in time to check in to my B&B, count the stock that had been sent there in advance from FSFE’s Dusseldorf office, pick up some food on Sauchiehall Street, and go to bed. The next morning I arrived at the conference venue on St. George’s Square at 09.30, and after being introduced to various Pirate Party UK members, I set up my first FSFE booth – complete with the new banner. I had to quickly assemble the CD stands that I had printed on a friend’s computer in my Manchester co-working space. Once complete, they looked good, and helped me distribute about 15 CDs – copies of Fedora, Mandriva, and the FSWIN (Free Software for Windows) CD. The merchandise was popular, and I sold four t-shirts; mostly ones which read “hacking for freedom”. The day included by talks by leaders of pirate parties in the UK, Sweden, Switzerland, and also the PPUK Executive Council. My talk came last, and I took the opportunity to explain the importance of Free Software to pirates, particularly in terms of accessibility, security, participation, and most importantly, freedom. I was pleasantly surprised by the warm enthusiasm for Free Software that I witnessed in the majority of attendees. When I asked at the beginning of my talk “who here is already using Free Software?” almost every hand was raised! Not only that, but several people that I spoke to were already using GNU/Linux, and many were Free Software activists in their own right. 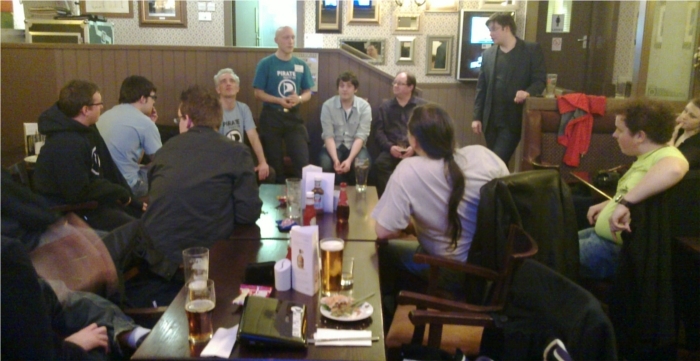 I made new contacts in Manchester like Tim Dobson of Manchester Digital and Loz Kaye (current PPUK leader), and came back with new ideas for FSFE’s press releases, following an animated discussion in a pub about PPUK’s current press release procedure. During the question and answer session following my talk I was asked “what can the Pirate Party UK do to appeal to British members of the Free Software community”, and this has caused me to think about ways to build stronger bonds between the two groups for mutual benefit in future. I headed home on Sunday, and although I had a bad cold throughout the trip, I had a good time, and was met many new like minded British activists. 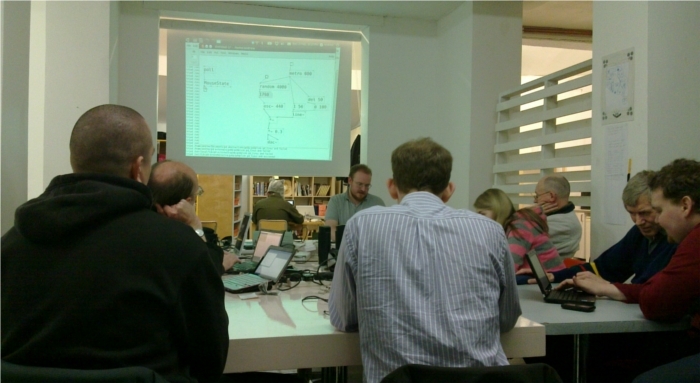 On Tuesday I attended a workshop on Pure Data (PD) hosted by Manchester Free Software (MFS) at Madlab hackerspace. By the end of the evening, most attendees had used purely graphical drag-and-drop tools to create mouse controlled synthesised instruments. The room was filled with cacophony of 50’s style beeps and twangs. Clanger fans were well catered for. I learned that PD is used as a back end for many games and audio applications, including the massively successful Spore. I saw great potential for the use of PD by performance artists and interactive exhibitions. A variety of people took part, and I was glad to see a comparatively high percentage of women getting involved. Pure Data workshops are held in Manchester each week. I’ve recently had to do a lot of work on a set of data relating to my bank account transactions, which required a great deal of text manipulation, and working with several regular expressions. My bank doesn’t believe that giving their customers access to digital copies of their account and transaction history is important, and they only make available images (stored in PDFs) of past statements which have been posted. Because of this, I had to use Optical Character Recognition software to extract text from the images, fix by hand all the errors in the resulting output, and then manually structure the data into columns and rows by using regular expressions (as my OCR software didn’t detect them). To make matters worse, the images provided by my bank had a large text watermark on each one, written diagonally across the page stating “duplicate”. All contents of the spreadsheet which came into contact with this text was unreadable during OCR, and had to fixed by hand. Once the data was successfully extracted and structured, I still had a problem however – my bank chooses to list each date only once, and so most of the listed transactions for my account had no date associated with them. The date is critical for the data to be useful to me, and I couldn’t sort or further analyse the accounts without knowing the date that each transaction had taken place. After some thought, I decided use a regular expression to fix the problem. A spreadsheet with thousands transactions, one per row, where the date of each transaction is listed only once, with all following dates of that transaction missing a date (transactions were listed in date order). 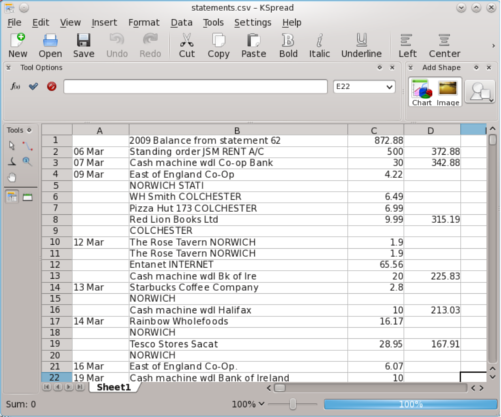 Before further processing the data (sorting, analysing) I needed to ensure that each transaction had its own date listed in the correct column. By using regular expressions in KDE’s Kate text editor, I was able to quickly associate all rows with the correct date. I searched for empty cells which should have housed a date, and for each one took the date from the transaction above. I repeated this until each row had its own date. The pattern finds all dates in the correct format and which begin the row, are contained within a cell (I used semicolon ; cell delimiters to avoid confusion with decimals and thousands in this CSV), and are followed by a row which does not contain a transaction date (ie the first cell is empty, and the newline starts with a cell delimiter ; ). Each time the pattern is found, the matching text is replaced with the same line and an altered version of the first cell of the following line. The replace pattern inserts a duplicate of the date found in the first line into the first cell of the following line, thereby copying the date from one to the next. Having entered these patters into Kate’s find and replace fields I clicked on “replace all” several times, until no more matches were found, meaning that all transactions now had a date associated with them, listed in the correct table column at the start of each new line. 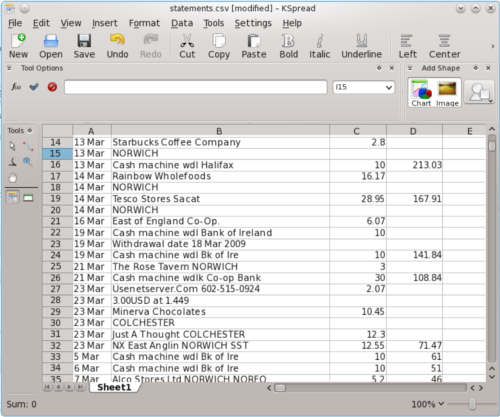 My spreadsheet now contains a complete dataset, with each transaction correctly dated. I can sort the data as I wish (by price, incoming or outgoing, location, business, etc.) and easily manipulate it in preparation for submitting my tax return.